Happy Chinese New Year 2014 to family, friends and loyal readers of this blog of mine. On the eve, we had the reunion dinner where family members from near and far sit together for the dinner (basically food, food and more food). 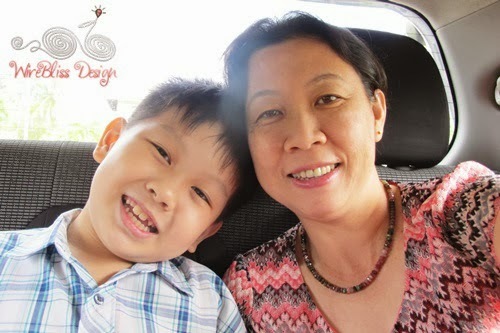 This year we have Annabel, Kwang and Abby over for the dinner as well (their first after moving back to Kuching). The reunion dinner is considered the biggest event of the Chinese New Year. As such children always make it a point to get "home" for this occasion no matter where they are. Not for me though, as I am considered married into dear hubby's family so I am with hubby and family (ah, complicated tradition ya? Never mind, leave this for some other time). The rest....well I can ignore them. Final cleaning of the whole house after the reunion dinner (to sweep away ill old luck and welcome the new good luck). I thought we can rest after the fulfilling dinner but NO, we have to work some more....right till before the clock strike 12:00 am. Can't bring the dirt into the new year. Setting off fireworks (to scare off the bad spirit) at the strike of 12:00 am (although others started way earlier, like after dinner). 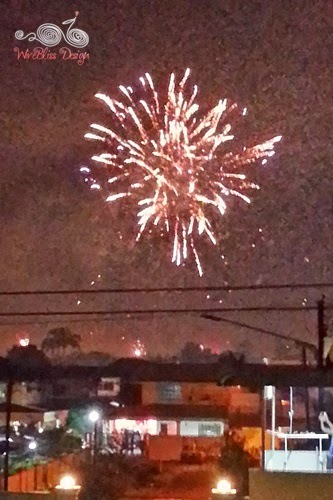 I am not good at taking fireworks pic. This is the best pic I took. 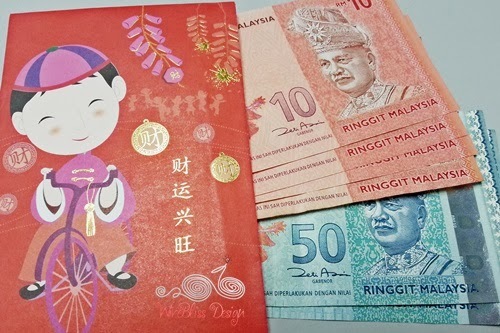 Next day, on the first day of CNY, first thing first, we distributed red packets or Angpows (with $$$) to the parents and the boys and the unmarried family members. to every Chinese New Year because we were at the receiving end. we will be both, giving and receiving...hehe. Of course they go into the boys' account. Then we dressed up a bit, preferably in red (pinkish for me this year), ready to receive visiting family and friends and vice-versa. We visited the temples, praying for a prosperous, successful, happy, joyful, healthy, abundance, bountiful, smooth, good luck, peaceful, etc. etc. new year of the horse. At the temple with the boys. William is almost as tall as I am. 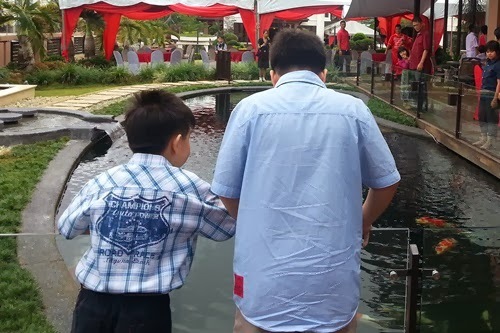 William and Henry excited over the Kois. 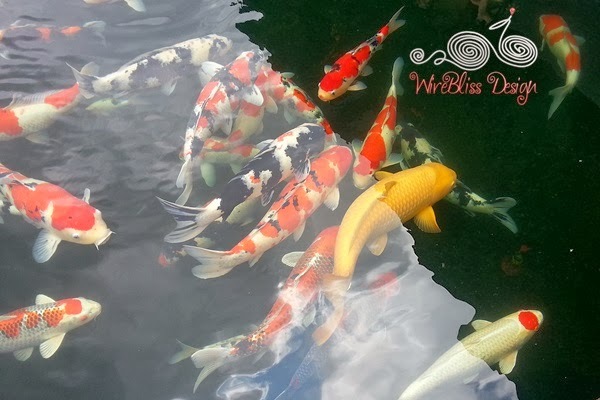 Koi Fish symbolizes success and wealth. Lion dance performance. 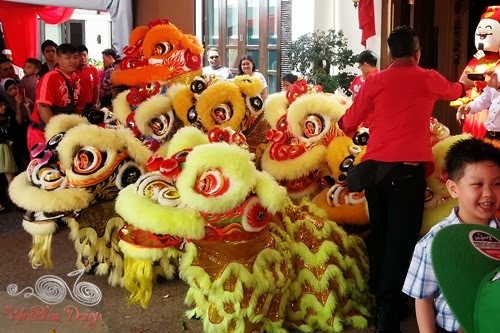 They are usually invited to perform privately or at special functions, at different days of the Chinese New Year celebration. 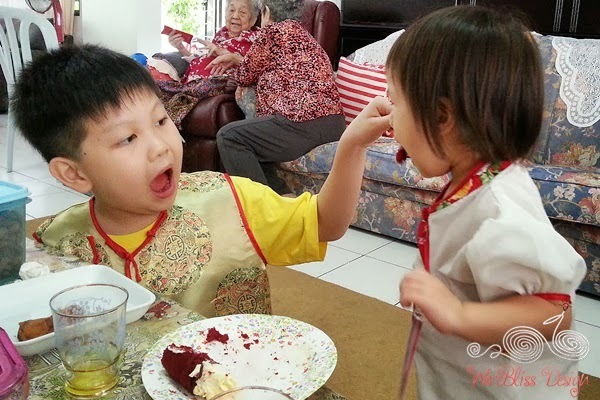 That's about it - the happenings around our 2014 Chinese New Year celebration. The way you celebrate yours might be slightly different from ours. Feel free to share and comment. Labels: Jewels at Home , Offwire Rambles Share it! Happy New Year! Thank you SO MUCH for sharing this- I've never been to Malaysia, or Asia at all, so this is fascinating to me. Your pictures are great- that's amazing, how you captured the fireworks, and the koi, too. It all looks like such a lovely time! Hope you have a prosperous, health, and happy New Year! Same here. 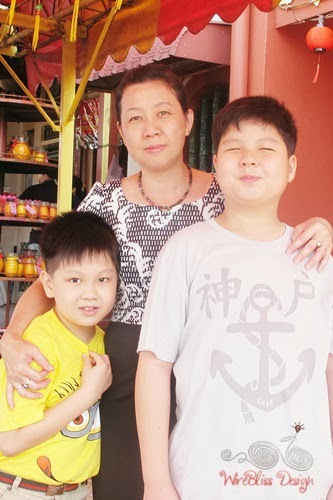 I have never been to your side of the world too :) Overall the boys are having a great time and we have till Feb 14 which is the 15th day of CNY to celebrate.